As the US enters tornado season, there is a lot to know about these funnel-shaped summer storms. What causes them? How strong are their winds? Which months have the most tornadoes? Popular films make it look as if all the action happens in the funnel cloud itself, but in reality, dangerous winds are swirling up to several miles away. For an example, look at water going down a drain: water is swirling all around – the funnel you see in the middle is merely the most visible part. Don’t try to get close to tornado to watch it – get to safety! There are lots of ways to study tornadoes without getting close to them. This month’s mission will get you building a tornado model, studying the ways of these fierce storms, learning how to prepare for storm season, plus some things to do if a tornado should hit. How many tornadoes have there been in your town in your lifetime? Which year had the most? Which did the most damage? 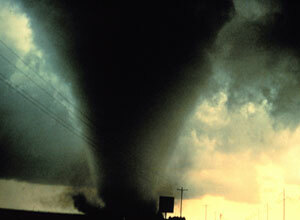 These activities help you understand the forces that make a tornado happen.